Heavenly Father, as we watch Notre Dame burn, we agree with Cardinal Timothy Dolan that, “This Holy Week teaches us that, like Jesus, death brings life. 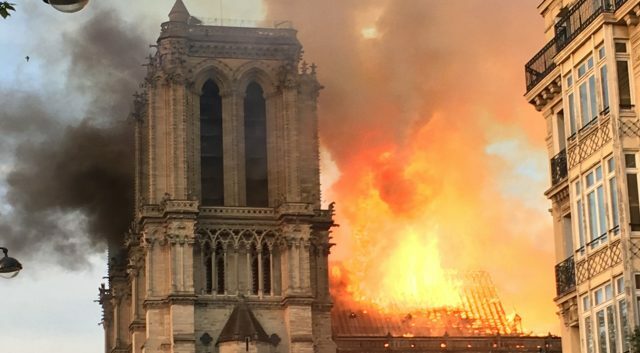 Today's dying, we trust, will bring rising.” We are so grieved by this loss to the Catholic church, to France, to history and culture, to the world. That is why we celebrate the words of Christ-followers like Cardinal Dolan, who direct us to the victory found in Jesus, which is highlighted this Easter week. We do pray for safety for all those involved with fighting this fire and then repairing the glorious cathedral. We pray for wisdom for those who lead the efforts. We pray for funding for restoration. And, Lord, we pray most of all that this place will continue to point people to you for centuries to come. And, as Cardinal Dolan pointed out, may we focus on Jesus this week: his death, his sacrifice for us, his resurrection. Rather than the fire bringing only dismay, we trust you will bring rising from this death by drawing more people’s attention to what Notre Dame stands for and the power of Holy Week. In Jesus’ victorious name we pray, amen.